What Does the IWW Do? An IWW member evaluates 2 goals: industrial power and developing organizers, and explores where they overlap and where they don't. People become IWW members in two ways. Some people join because of ideology and people join because of the union’s activity. Along the same lines, the IWW does two main things. First, it helps workers solve problems at work by helping them organize. Second, it transforms people. That is, the IWW improves some people’s live on the job and radicalizes some people through collective action alongside discussion. In doing so it gives them practical skills and confidence to do things. Another way to put this is as a pair of principles: building industrial power and building organizers. We need room for both of these principles. Our organizing should radicalize workers. And our organizing should make people who think of themselves as radicals more effective in fighting bosses and capitalists. In practice these principles are closely related. For instance the NYC warehouse campaign really got running because of the hard work and dedication of a handful of IWW members. This is basically true across the board for the IWW. The bulk of the work of maintaining and building the union rests on a relatively small percentage of IWW members. In this we’re like most unions I think. So, we build industrial power by using our current organizers. These principles work together. While these principles overlap, it can be useful to think about them separately sometimes. This gives us two different ways to evaluate success and set priorities. Let’s say in one shop we win an awesome contract for 100 people and develop no members of that shop into class conscious workers and active IWW members and organizers. Let’s say in another shop we lose and the campaign dissipates. But five people who were already IWW members become better organizers and five new members join from the shop and become organizers. The first hypothetical is better if our main priority is industrial power. The second is better if our priority is developing organizers. Personally I think if someone only cares about one or the other principle then the IWW may be the wrong group for them, depending on what industry they work in and what role they want to play. If someone wants to organize and all they care about is industrial power, other unions do a lot better at building industrial power most of the time. If someone wants to organize in a way that only focuses on developing class consciousness I think there are groups that do a better job than us. 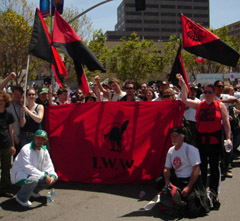 However, the IWW is one of the only groups I know that does both at the same time and is reasonably good at both. While both of these principles are important, my personal view is that right now the priority for the IWW should be to develop organizers. This doesn’t mean neglecting industrial power, because we can only meaningfully develop organizers by aiming at industrial power. But the reality is that the IWW relies too much on people who joined with their vision and values already formed and their skills already developed. Plus, turnover in the IWW is far too high. We need to get better at creating organizers, improving organizers over time, and retaining organizers for the long haul. This is a key part of building the One Big Union and ultimately abolishing the wage system.